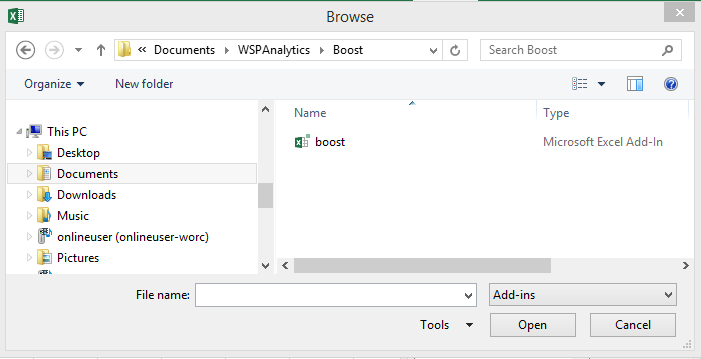 How do I temporarily remove Boost from Excel (as opposed to an outright uninstall)? How do I permanently uninstall Boost? I can’t download Boost. Nothing happens when I click the Boost download link. Alternatively, you will need to tell the anti-virus that Boost is safe. Depending on your anti-virus software and settings, you may not be presented with this option during the Boost download process and will have to manually change this setting in your antivirus software settings section. In the Internet Options window, select Advanced tab. Click OK to save the settings. Then close the Internet Options window. The Order ID is contained in an automatic email you receive after placing your order. More information can be found here. Note: Sometimes this email ends up in SPAM so make sure that you check your junk folder. First, ensure you are entering the correct Order ID. If you are transitioning from a Free Trial to the Full Version, be sure not to use the Order ID from the Free Trial, as this will not work. You will need to install the 2007 Office system hotfix package at http://support.microsoft.com/kb/976477. The Browse window will open. 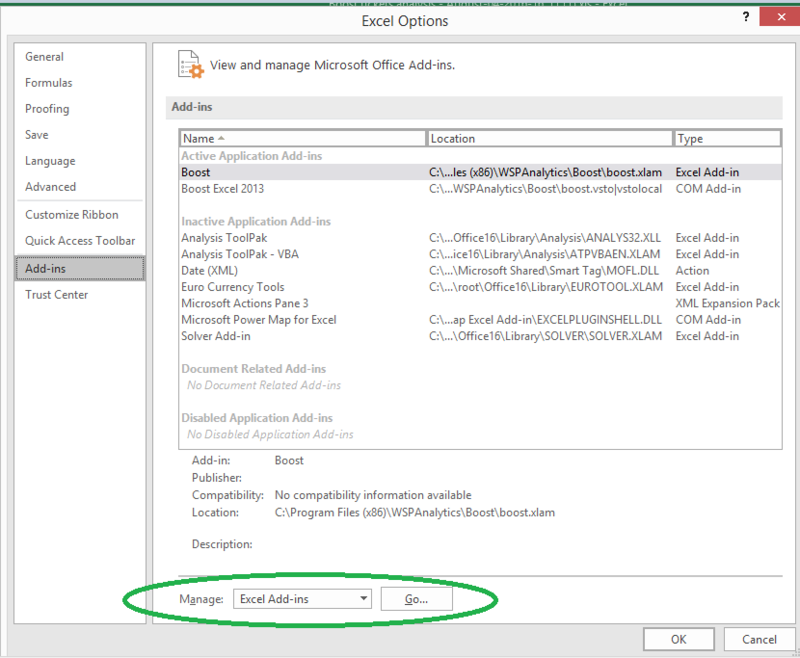 Select the boost Excel Add-in file, and click open. 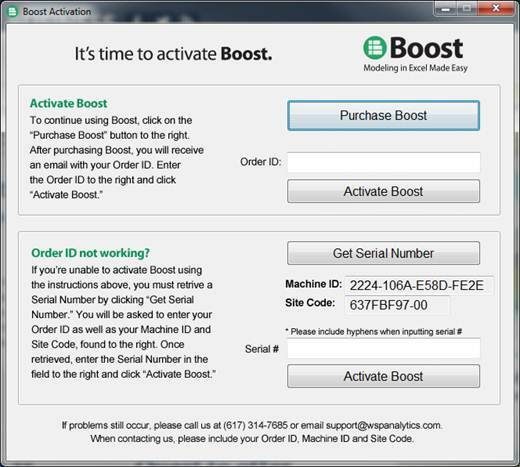 Boost will now be added to the Add-ins available list on the Add-ins window. Select Boost, and click OK. 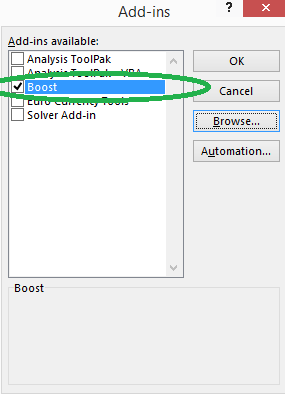 Select Boost from the Add-ins available list, and click OK. 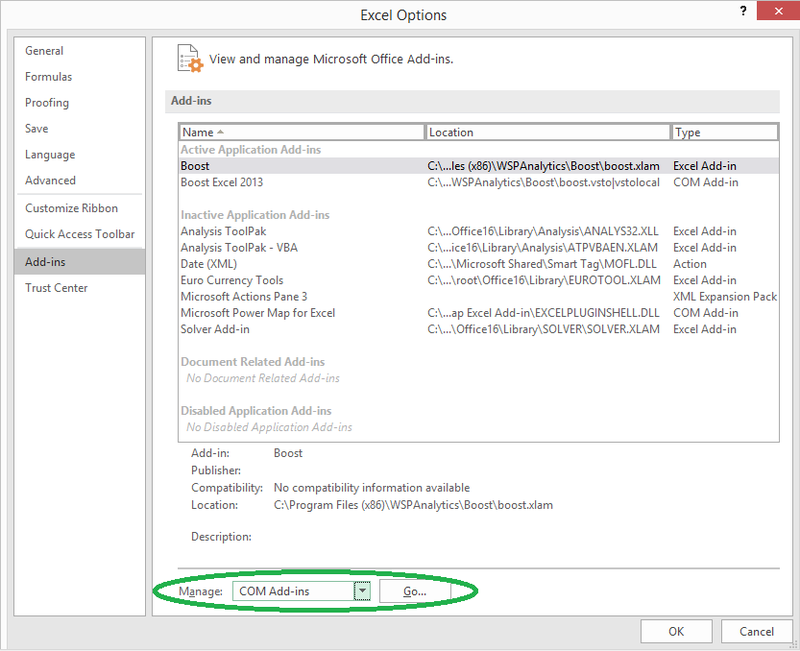 In case Boost appears in the Disables items list, mark it, and choose Enable. 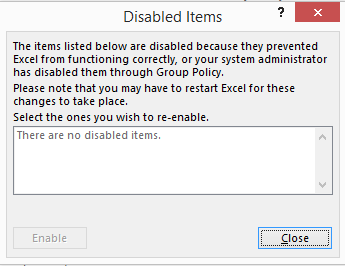 Note that Excel will need to be restarted for this action to take effect. Go to ‘Control Panel’ in your computer -> Programs -> Programs and Features. Select Repair from the upper bar. In the list of programs, stand on Boost. Select Uninstall from the upper bar. 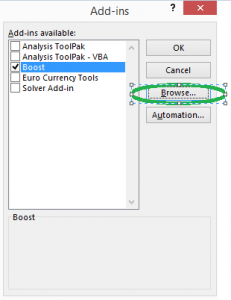 Re-install Boost from the installation link you have received. Please find below a list of Boost Known issues, that can affect the user’s experience. 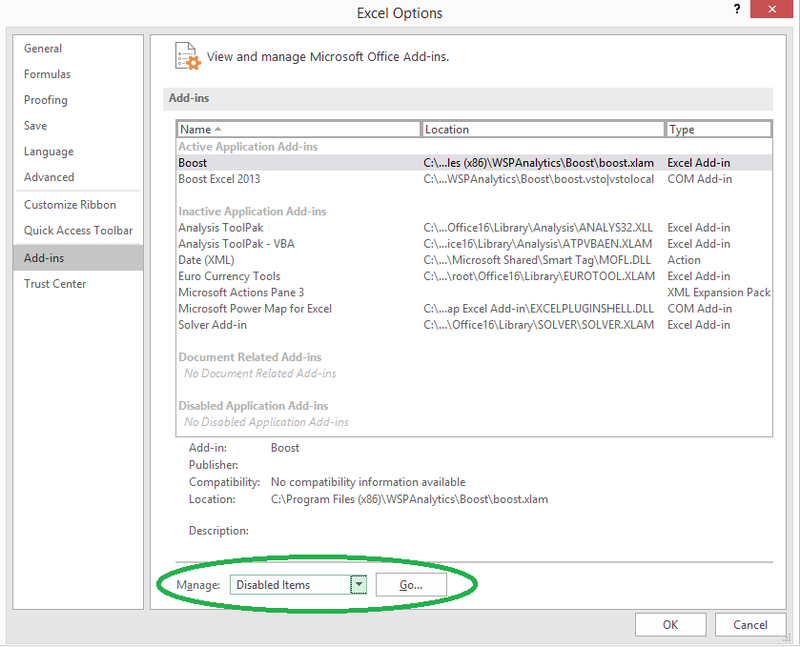 Please see the instructions at http://office.microsoft.com/en-us/excel-help/load-or-unload-add-in-programs-HP010096834.aspx. Boost uninstalls similarly to most programs. Open the Windows Control Panel and select “Programs,” locate Boost, and proceed through the uninstall wizard (instructions can be found here. Note not to perform the last step of re-installing).